DENVER (AP) — No pitcher homers on Thursday. Just a well-played game for Nolan Arenado and company. 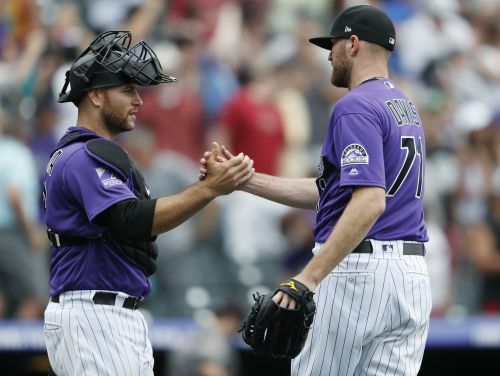 Gerardo Parra and Raimel Tapia had pinch-hit RBI singles in Colorado's three-run sixth inning, helping the Rockies to a 5-1 victory over the Arizona Diamondbacks. Colorado took two of three for its first series win against Arizona since May 5-7, 2017. The Rockies hit five homers in a 19-2 victory Wednesday night, including the first career drive for right-hander German Marquez, but they took the finale behind a timely rally and solid defense. "They've given us a really hard time, so to win a series finally at home against them feels really good," Arenado said. Trevor Story homered for the Rockies, and Kyle Freeland pitched six-hit ball into the sixth inning. DJ LeMahieu had two hits and drove in a run. Colorado trailed 1-0 before its rally in the sixth. Arizona left-hander Robbie Ray (3-2) hit Carlos Gonzalez and walked Chris Iannetta with one out before he was replaced by Silvino Bracho, who was called up before the game. Parra then hit a tying single to right, and Tapia followed with another single off Andrew Chafin. LeMahieu drove in Parra with a sacrifice fly. "The Iannetta at-bat was very crucial and I think it swung the game a little bit," Arizona manager Torey Lovullo said. "Chris is a very experienced hitter. He's going to fight you all the way through the entire at-bat." The Rockies added two more in the seventh on Story's 18th homer off of Randall Delgado and Gonzalez's RBI single. "We got a couple of clutch hits and we put an inning together," Rockies manager Bud Black said. "We nicked their bullpen a little bit and our bullpen did a good job." Scott Oberg (3-0) got two outs for the win. The Diamondbacks jumped in front on A.J. Pollock's RBI single in the first. Paul Goldschmidt and Steven Souza Jr. each had two hits. Souza led off the fourth with a triple and hit a leadoff double in the sixth and was stranded each time. Ketel Marte, John Ryan Murphy and Ray struck out in the fourth, and Souza was thrown out when he tried to score from third on Murphy's hard-hit grounder to a drawn-in Arenado in the sixth. Arenado, a five-time Gold Glove winner at third, knocked Murphy's smash straight up, grabbed it out of the air barehanded and threw a strike to Iannetta at home. "I already knew where I was going to go with it, I had a feeling he was going home," he said. "Luckily enough it popped up and it was just right in front of me. It was a big out to save a run there. "Those are my nightmares. Righty, top-spinner, those are always the ones you get uncomfortable with." Diamondbacks: RHP Clay Buchholz (strained left oblique) is scheduled to pitch a simulated game on Friday. Lovullo said Buchholz will throw 55 to 60 pitches. Rockies: RHP Chad Bettis (blister) won't be activated from the 10-day DL for a possible start Saturday. Black said he will announce the starter for that day on Friday. The Diamondbacks placed right-hander Shelby Miller (right elbow inflammation) and left-hander T.J. McFarland (strained left neck) on the 10-day disabled list and recalled right-handers Matt Koch and Bracho from Triple-A. Miller left Wednesday's loss with elbow tightness and was sent back to Arizona for further evaluation. It was Miller's fourth start since returning from Tommy John surgery. "He's going to get an MRI," Lovullo said. "Holding out hope and always optimistic that it's going to be as positive as it can be. (Wednesday) night was in a rough spot, he felt bad, but nothing he did was his fault." Diamondbacks: RHP Zack Godley (10-6, 4.85 ERA) will face Anibal Sanchez on Friday to start a three-game series in Atlanta. Rockies: RHP Antonio Senzatela (3-2, 5.34 ERA) opens a three-game home series against Seattle on Friday night.